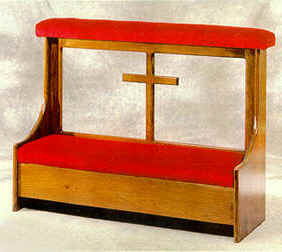 Hepburn Superior is proud to offer Limited Edition Furniture to add beauty and style to your chapels. Reverent, elegant and practical. These three words best describe our Baby Bier. This beautiful unit conveys a delicate situation well. The bier is 37" tall with a 30" x 16" surface. made of high quality cherry. Note: Frame is solid wood. Inserts are wood panels. look while maintaining a sturdy base. 26 1/2" x 18 3/4" triangle glass front. *Wooden flag case can be purchased separately. Our Limited edition prayer rail sets the standard in terms of quality. 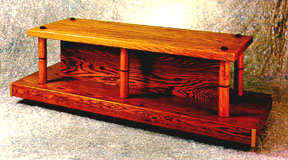 Made of solid walnut, this prayer rail will provide with years of use. 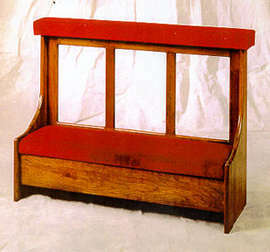 The Limited Edition Prayer Rail is 44" x 33" with a 4" wide arm rail and 12" wide cushioned knee pad. The Bier is 66"L x 22"H with a surface of 56'. These measurements provide a durable casket conveyance that is pleasing to the eye. 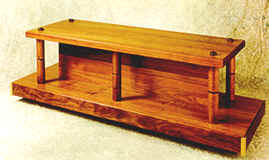 When a casket is placed on the bier, it rests on four rubber bumpers on the top of the surface. These bumpers serve two purposes: one, they prevent the casket from sliding, and two, they save the surface of the casket from being scratched. Comes with 4" double bearing casters.